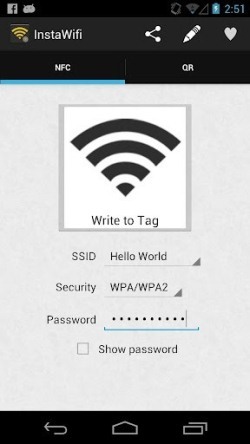 Quickly Connect And Share WiFi With InstaWiFi: When using a Wi-Fi at home or work, never missing relative or friend who wants to connect to the Internet. Instead of sharing the password and write it, you can try the network share by using InstaWiFi. InstaWifi is a free application for Android phones that makes it easy for you to connect and share WiFi networks with your friends and family instantly through the use of NFC and QR codes. Simply tap the phone on a label, or scan a QR code to connect to a WiFi network. If you have an Android phone Rooteado, the application can automatically add the current password once you make access provided. If your phone is not Rooteado, you must enter the password manually. 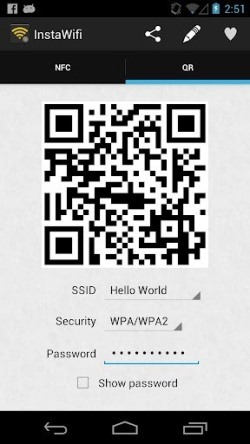 InstaWifi only necessary to generate QR code for wifi network. Once you have the QR code, any Android phone with the application to scan the barcode. For the characteristics of NFC, InstaWifi needs to be installed on the device to read the label properly NFC. With the NFC feature available in the latest smartphones, this app can come in handy for quickly sharing WiFi networks.